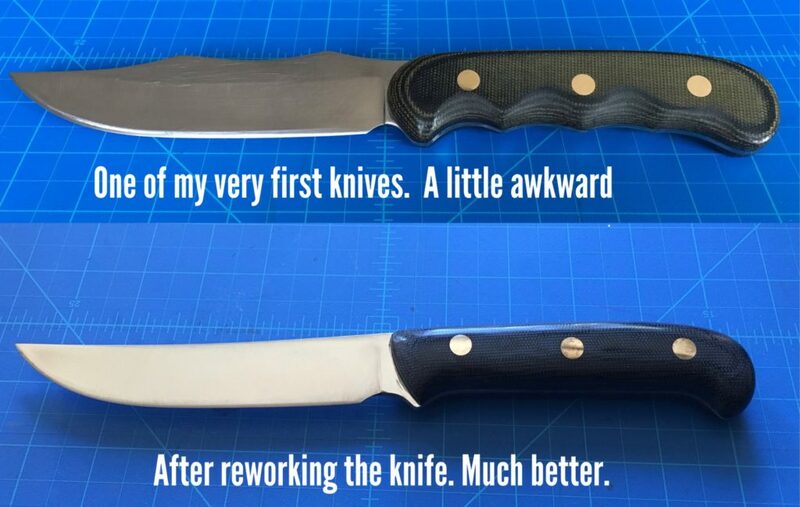 After getting a few knives under my belt I looked back at some of the first ones and decided that I really did not like this knife as much as I did at first. The handle was ugly, and that spine! what was I thinking? I thought it looked cool, but it does nothing to enhance how well the knife performs. Not only that, but I decided to use an expensive steel (CPM S90v) without taking into account my extreme lack of experience. I know, silly right? Reshaped with a better bevel, got rid of that nasty spine and finger grooves. The first thing I did was remove the handle and start to carefully reshape the spine giving it a gentle sweep while making sure that the metal never got hotter then I could touch. This meant new sharp belts and water to keep dunking the knife in every few seconds, or when it got too hot to touch. This kept me from destroying the heat-treat that I had already done. I also reshaped the choil a bit and removed the finger grooves in the tang. I really feel that the lines are much better this time. knife with scales held with epoxy and corby rivets. Also in the picture is is my kiridashi and a wood pattern that I used to make the handle. After reshaping the knife, I drilled and cut some black canvas micarta for the handle. 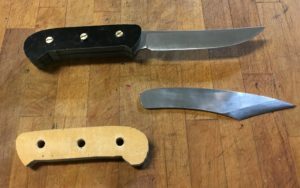 The wood pattern was created for the corby bolts to sit in the holes so that I would have a stable surface to rough cut both scales on the band saw while screwed together. My son at this point called it a minecraft knife. 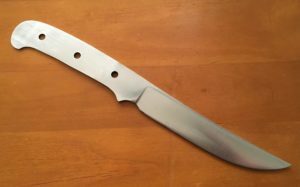 Completed kitchen knife after re-making from misguided initial design. 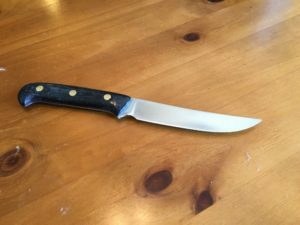 With a bit of work and a better idea of what a useful knife really looks like, I was able to take what was previously a misguided design and re-work it into a very nice kitchen knife for my Wife. She tells me that it cuts like a dream and with the CPM S90v steel it should hold an edge very well. I won’t know for sure until we have used the knife for a while, but my money is on it being a success at this point.